Faith, Coffee & Love : Celebrate with Me!! Hello everyone!! It’s finally February!! Woo-hoo! I have been waiting for today for a couple of weeks now :) SO! do you see something different about the blog?? TA-DA!! I gave it a makeover!! Whadda think?!! Whadda think?!! hehehehehe! I’m so excited to make this change, I have known now for quite sometime that the name of the blog had to change, it no longer described me or my writings, so for months I’ve thought and pondered about what the change would be. A few days before running the ½ marathon an idea starting forming, and the days after running it all came to me in a sudden thought. Running in Faith. That's what I have been doing all along. When I began running I found myself digging deeper into my faith, first in God - as in “Lord please help me make it to the end of this mile!! !” slowly it became easier to run and my prayer became more focused on others, family, friends and my running. I then realized friends and family sort of had faith in me. You have no idea how many times I wanted to give up and throw in the towel. On those days I would run into someone or have a family gathering and you would tell me how proud you were of me! I’d get a fist pump! or a “good luck on your race- you can do it!” even a “wow you look great!” It may sound cheesy but you said it not me :) Eventually I've found faith in myself too. I have been through a hard run feeling like I just got beat up from head to toe, not just physically but mentally too. I walk away knowing deep inside I can do this. I know I can, because I’ve come this far, because I’m blessed to be physically able to and because my support team is simply awesome. I also have faith in others. Lately someone will ask me how I did it, and do I think they can do it too. Yes we are each very different but I have faith that anyone can make a change to set their world on fire too. SO!! to set off this awesomeness I am going to have my first ever virtual 5K!! This 5K is for you, for anyone out there who has never done a 5K, for those of you who have been meaning to get back to walking or running, or have been meaning to start walking for your first time and of course for the runners that want to set a new PR or simply would love a 5K with no chip, no pressure and just pure relaxing fun! This can be a stroll you take or a meet up with friends for a long gossipy walk. If the thought of paying out for a 5K and not knowing how you would do is intimidating - then this 5K is for you! It’s free! In February of last year, the weekend right before my birthday, I had been following the Couch25K app for about a month and a half and I decided to go out and run a 5K. With no one else there, no pressure of time and as self conscious as ever, I asked my family to go to Memorial Park in Houston and basically wait for me as I ran my first 5K distance ever. It was slow and grueling but I did it and it felt great! How do you sign up?? By clicking right here. 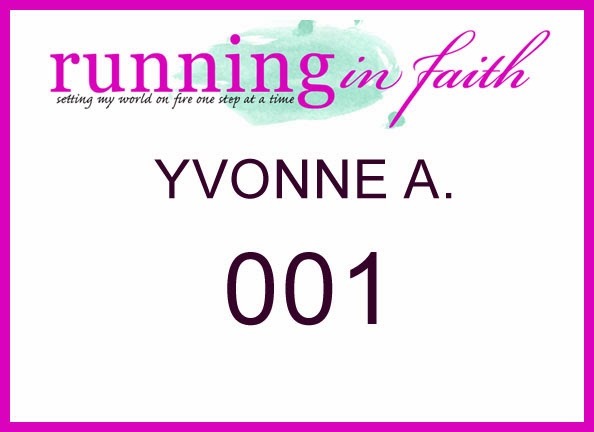 You can email me your “Finisher” picture at runninginfaith48@gmail.com. I will be getting together on the 22nd at Memorial Park at 9am for anyone who would like to join me in completing the 5K as a group. If you have any questions please feel free to email me or comment below!! So happy you are doing this, should be fun. Oh oh and the blog AMAZING!!!!!!!! I love your new look!!!!!! Very fitting!!! Let's set this world on fire!!!!! Thank you Gavin aka Abby and Connie!! Thank you so much for joining me!